Surprises all night long for the third show in Chicago. Here's a few of ours - add your own in the comments here. The Wanderer, from 1993's Zooropa, is the track that plays at the end of the first 'chapter' in the #U2ie story each night. The unmistakeable image of Johnny Cash on the screens, that unmistakeable voice in the house. There was another connection tonight. Lucifer's Hands was back in the set tonight, only the second time on the tour to date. Were you at the third night in Chicago? What were your highlights? Post your own review and add your photos here. Once again, an awe inspiring concert - or should I say PERFORMANCE! 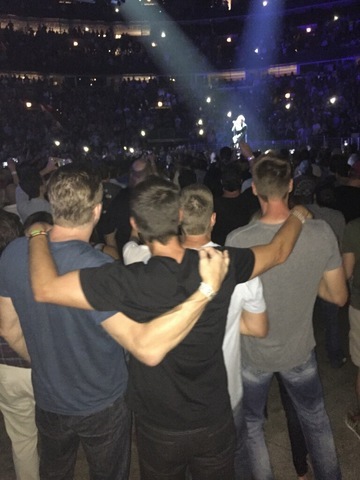 I have been to so many concerts of different bands, but no band holds a candle to U2! I convinced a friend to go with me who was not familiar with U2 very much. She admitted that she didn't think she was going to like it, but REALLY DID! We have another U2 fan! I have such great respect for a group of men that have been so dedicated for so long - loyalty. I am inspired by Bono, the way he lives his life, the fact that he is still married to his first love, and all of his humanitarian work! You guys are the BEST! We took an Amtrak 32 hours to Chicago (We got stranded due to flooding on tracks in Iowa) and got to our seats just as Miracle of Joey Ramone started...We were on our feet singing when Gloria came on as the second song. I would hope the band could hear this at some point but my husband Kevin Crabtree was able to sing Desire with Bono and be onstage with the entire band. My husband has been a huge fan for so long and this was a dream come true! As he told Bono onstage he beat cancer and we were blessed with our first daughter this year. The music of U2 has helped inspire Kevin through so many life experiences and he has a deep appreciation for the band and all the music they create. I want to say thank you for making a dream of his come true! After all the hardships he has faced with such courage he now has another beautiful memory of something wonderful happening! Thank you so much! U2.com, I am Kevin, the fan who was invited up on stage during Desire. Can you please share with me video that the U2 camera crew/ staff recorded that night please? It was a very very special moment and I would love to have that for our family, including our 4 month old daughter to watch when she's older. Thanks in advance! I have seen U2 twelve times since 1992 with every tour from Zoo TV on. This was probably the most intimate show because we were on the floor and every spot was close to the band- my wife-Lindsay, my 10-year-old daughter-Grace, and our 10-year-old cousin were with me. My wife could have swore that Bono smiled and waived at my cousin Becca.... I was very impressed with the new songs and the whole message and personal experiential meanings associated with Iris, Raised by Wolves and Cedarwood Road. I even screamed with my Star Wars shirt around my neck, when Bono announced that U2 was going to play Lucifer's Hands - I have loved this song since I first heard it back in October with the rift from Rejoice "I can't change the world, but I can change the world in me." I recognized this right away. Very cool concert and I wish, really really wish that I could afford to catch one of the shows in Madison Square Garden. I live in South Dakota. I am hoping that U2 will play in Minneapolis at a future gig. I am glad we gook the trek to Chicago. I also met a really cool U2 fan from Aims, IA! Awesome 5-star concert. 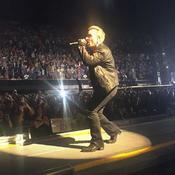 The only bad thing for me is that when you see a U2 concert, nothing else, and no other band comes close and so you feel underwhelmed when you see other artists and just with you were at a U2 concert! This was our 10th time seeing the Band who is once again conjuring the world! A great mix of old and brand new songs! We were in Chicago in December 2005 when U2 played Gloria the last time! Who doesn't love that song? I don't know what it is but when hearing I Will Follow in he first set always sets the tone for another Great show. See you boys when you come back to America next year. Be safe! God Bless & Long Live U2!! U2! I'm coming all the way to Chicago to see you on Thursday night since you're not coming to Florida! Please perform "Stay"....pretty please??? 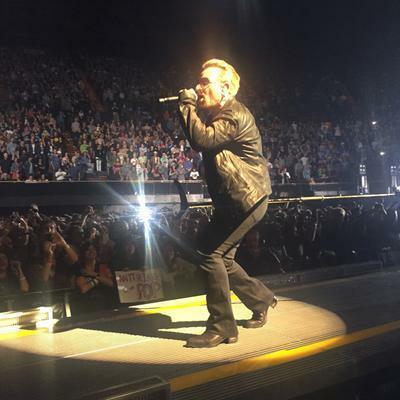 Bono: I was at the June 25 concert at United Center. Great show! I will return on July 2 for the last show at UC. Please sing GLORIA as you did last night. I loved the October album. Peace! Was there on Thursday 6/25. Bummed I can't be there tonight or the other nights in Chicago. How long to sing this song, How long to sing this song, How long...how long...how long... How long...to sing this song... ...This Is Where You Can Reach Me Now. When will this amazing song be played?